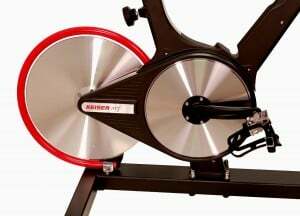 Keiser M3 Plus Indoor Cycle is called the leader of the pack! Why? That is what I am going to explain. This equipment is an Award winning machine and one of the most recommendable spinning bike of all times. It is a highly innovated machine compared to its predecessors and contemporaries. It is an advanced machine with features that are not usually present in most spin bikes. It has an LCD monitor that displays your workout data with the possibility to even observe your heart rate as well. It has a magnetic resistance system that makes the operation to run smoothly and quietly even as it provides extremely challenging workouts. The manufacturer had to spend a good amount of time (over 10 years) and in-depth research to come up with the design of this bike. It is almost maintenance free and very efficient. This bike is equipped with every feature that is required to achieve your fitness goals, which many users have attested to through their feedbacks. At first, I thought the cost was a little bit pricey, but after having a complete look at it, I discovered it might just worth every penny after all. The reason, you will soon find out in this review. What is special about this bike? First thing first, when you take a look at this unique spin bike, one would think it was made… or let me rephrase, was carved out of an aluminum block! Yes, as though it was just literally carved out of an aluminum. It has a stable and sturdy look/appearance. One might be correct to call it a bulletproof, OK, maybe not quite, but I am just struggling with words that can fit the description of this stuff. With its sleek and smooth looking texture, so does the performance while being used for a workout. SLEEK and SMOOTH. Now, why is it different from other bikes? The reason is simple like I said earlier it took the company about 10 good years to perfect the design of this equipment, thereby making sure it has the durability and quality that is outstanding both on the parts and the frame. It will surely save you the money and time, and that is why I think that the price is not too costly. The console and the magnetic resistance system are exceptional features that are only present in very few indoor cycling bikes. Exercising with Keiser M3 Plus Indoor Cycling will help you lose that extra fat fast if you are the type that is looking forward to losing weight. It has this special resistance levels that make your workout to end up with a positive result. However, that is depending on your commitment and stamina; how much you put in, in your workouts. You could lose around 1000 calories per day, BUT that is depending on how much time and commitment you are putting in your workout. Sure, you can’t beat that result, no other bike will. Its design is such that, it’s outstanding and would most definitely be loved by professionals and amateurs as well. Here is the beauty of Keiser M3 Plus Indoor Cycling. It has a magnetic resistance system called the 24-gear Eddy current magnetic resistance. The function of this system is to pull all the major muscle parts of the body to be actively involved in the workout! Can you beat that? In other words, working out with this equipment ensures that the whole body system is involved and impacted positively. Good for lower and upper body exercises. Because of this singular function, it enables you to burn more fat per a given time than any other spin bike would. It has the ability to give you the feel of a real outdoor cycling bike too. It is equipped with a drive belt that produces a smooth, quiet and natural glide, thereby also giving you the opportunity of enjoying your most favorite music, show, or even movie while working out. Built-in computer with LCD, display-This tracks the time, distance covered, calories burned, heart rate, and power output. Smooth, whisper quiet drive belt that can even enable you to use it in your living room without having the rest of the family disturbed. Transport wheels for an easy move about. It is very difficult to find any sort of downside of this spin bike. However, there was a user that complained of getting the delivery in a bad shape (bent frame), which he requested for a replacement and was replaced. Upon getting the replacement, during the assembly, he discovered again that the ‘gear lever’ was crushed and has a clunking noise while pedaling, which he also reported to the company and replacement parts were delivered. But this is not really a drawback because it happened as a result of mishandling during the shipping process. Keiser M3 Plus Indoor could be pricey for some people. But that is an exchange for what? An exchange for durable, unparalleled reliability and sleek design that will give you all the comfort and positive workout result that is hardly obtainable from any other spinning bike. It is truly something different from the conventional spin bikes that are found nowadays. If you are a person with a special taste and can afford it, I will definitely suggest you pick yours HERE! But if you are looking for something else that can offer you decent workouts with good result without all the extra technological features and still affordable, then click HERE. I really do believe I have been able to provide you with enough information to help you make your decision on this cycling bike. If you have any experience with this equipment or have a question of some sort, please, do not hesitate to drop your comment in the comment box below. Enjoyed this run down. Exercise bikes really are looking slick and compact these days. Thank you for dropping by and finding this post useful to you. The Keizer M3 plus indoor cycle looks outstanding. I can see that sitting in my living room right now, looks very well made and useful. You can say that again! This equipment really worth every $ you are spending on it. Great Info man, I actually just finished building my home gym. The Keiser M3 Plus Indoor Cycle 2014 could’ve been a great addition. I wish I would have seen your site a few months ago. I’ll be sure to save and bookmark it for the future…. That’s great! You can always look it up when ever you can. Thanks for dropping by. You may want to check out this one. It could be within your budget.